Figure 1. Caiuajara adult skull. Color bones added. Their premaxillary crest also includes the nasal. Blue = jugal. Yellow = missing teeth. Fo = foramina. Wonder if those represent ancient tooth sockets? For now they are blood vessel holes. Exp = ventral expansion of premaxilla, but it’s really the nasal. That’s where the descending process drops on certain other pterosaurs. this time with subadults and juveniles (no eggs or hatchlings) of a new tapejarid, Caiuajara dobruskii (Manzig et al. 2014). 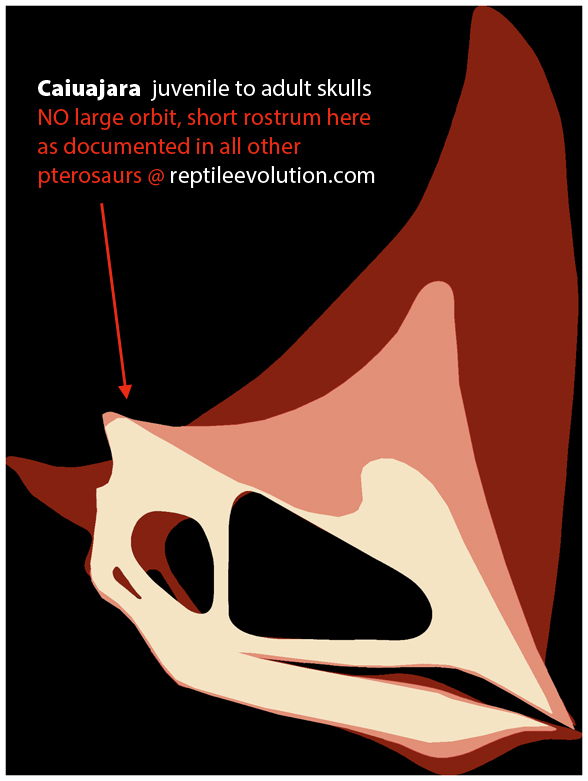 Contra traditional paradigms, there is no indication of a large orbit and short rostrum in juveniles (confirming earlier posts here and at reptileevolution.com. Yes, the crest developed in adults, because it wouldn’t have fit inside the eggshell! At least 47 individuals here. Smallest were twice the size of hatchlings, one quarter the size of adults. you can’t tell the females from the males. All had crests. Figure 2. from Manzig et al. 2014. Note the lack of change in the size of the orbit vs rostrum in Caiuajara. Figure 3. Typical portion of bone bed of Caiuajara. The size of the crests, both below and above the jaws, became larger with age. Most of the individuals were young with only a few adults present. Figure 4. Caiuajara skulls to scale. 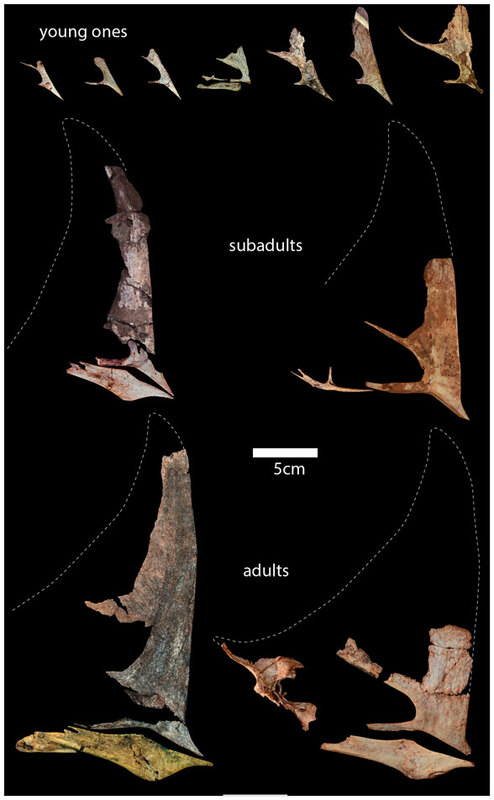 The authors found no allometry during ontogeny in post-cranial elements, but adults appear to be more robust and the scapula fused to the coracoid in adults only. 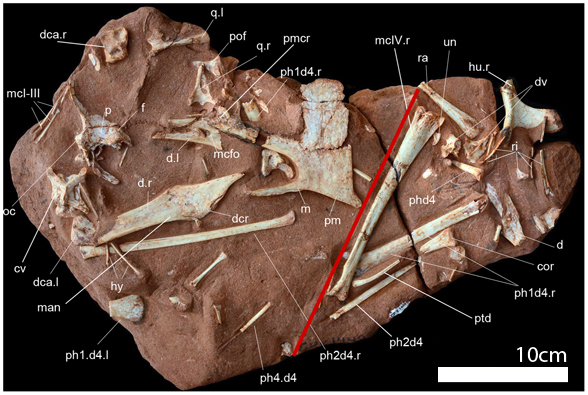 This confirms what I’ve found in the fossil record in Zhejiangopterus, Pteranodon, Pterodaustro and generally in phylogenetic analysis. Now, after so much evidence, I hope the naysayers will give the hypothesis of isometry during ontogeny in pterosaurs its day in court. Figure 5. Caiuajara post crania, a. humerus, b. femur, c. coracoid and scapulocoracoid, d. sternal complex. Hypothetical hatchling elements added at 1/8 adult size. 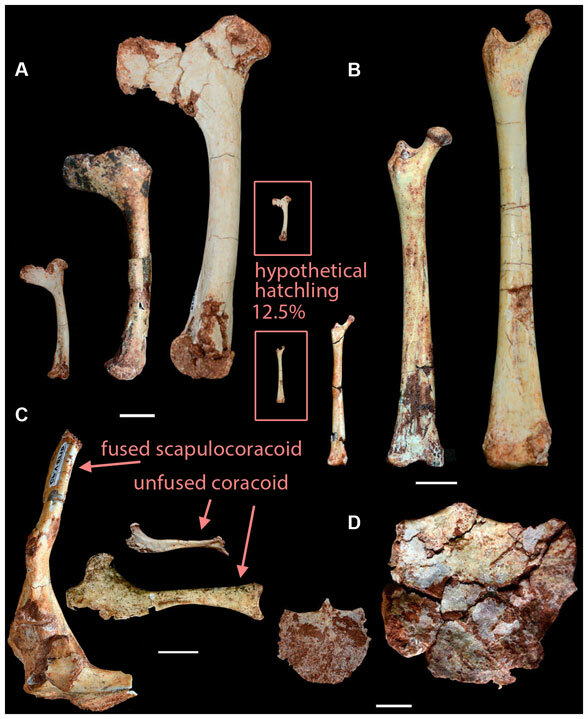 Finally, a fused adult coracoid along with an unfused juvenile and subadult coracoid. Scale bars = 1 cm. Caiuajara is a small tapejarid, very similar to other tapejarids. This brings up the subject of lumping and splitting with nomenclature, whether a new genus is warranted or not. 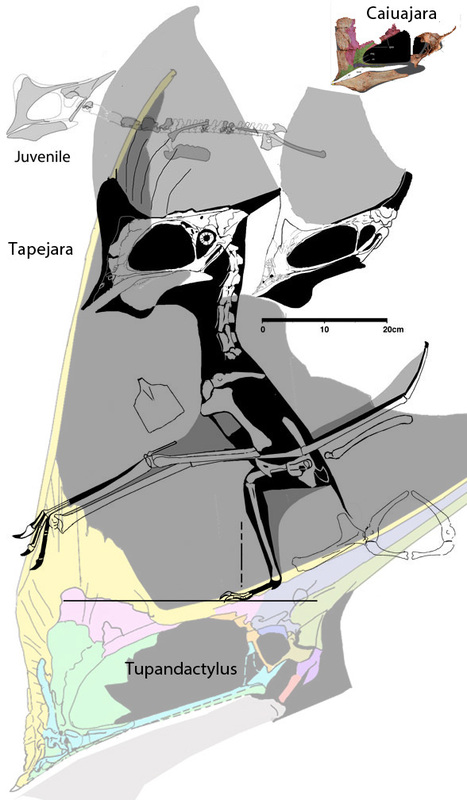 Is Caiuajara just another species of Tapejara? If not then we need to start splitting up other genera clades containing a wide variety of morphologies as in Rhamphorhynchus, Pteranodon, Germanodactylus, Darwinopterus and other pterosaurs, in which essentially, no two are identical. I’ll leave that to the experts. It’s going to take more than consensus. Figure 6. Caiuajara size comparisons. There is quite a variety of tapejarids, approaching the variety in Pteranodon, Rhamphorhynchus and other pterosaurs. Note that in the larger Tapejara there is still a suture in the scapulocoracoid. Here we have a large number of juveniles (not hatchlings) and only a few adults in a sandy environment sometimes flooded by rising waters from a nearby lake. What does this mean? Pterosaur eggs are large enough that only one could be produced at a time, and held within the mother until just prior to hatching. So the large number of juveniles in this case (no hatchlings here) huddling together, did not belong to a single set of parents. The authors were right, pterosaurs of a certain size (perhaps hatchlings, but up to twice the size of hatchlings in this case) were able to fly. Since they were hatched individually the hatchlings/juveniles sought each other out at an early age, and sought out the company of older, larger tapejarids. Those crests made identification easy. It did not matter that the adults were their parents or not (distinct from the nuclear family illustration at Nat Geo) because the numbers don’t match up. Now IF the adults were found in a distinct layer from the juveniles, the speculation about the adult influence has no basis in evidence. Manzig PC et al. 2014. 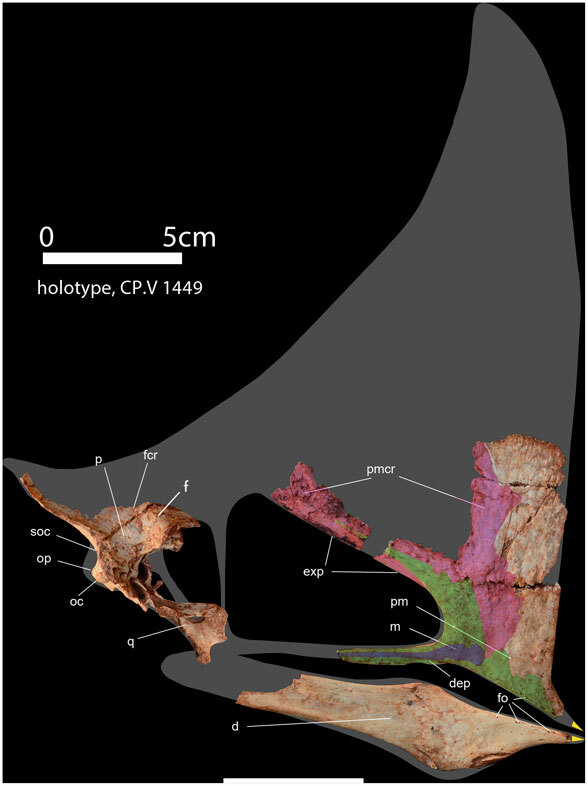 Discovery of a Rare Pterosaur Bone Bed in a Cretaceous Desert with Insights on Ontogeny and Behavior of Flying Reptiles. Plos ONE 9 (8): e100005. doi:10.1371/journal.pone.0100005. This entry was posted in pterosaur crest, pterosaur growth patterns, reptile family tree, tapejarid and tagged pterosaur, pterosaur growth patterns, tapejarid by davidpeters1954. Bookmark the permalink. That sounds like a short, baby-faced pterosaur. The postcrania isometry is interesting. They said that, true, but look at the illustration. Look at the fossils. Welcome to the paradigm. They couldn’t bring themselves to break away from it. And you bought into it because you read it in the text. Rob, if you can find one juvenile that has a proportionally shorter rostrum than one adult, please bring it to my attention. See Figure 2 above.